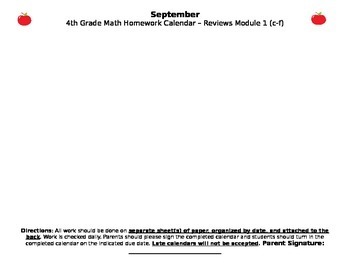 This September Calendar reviews content from Engage NY 4th grade Module 1 topics c - f. It is a word document so is completely editable for your needs. Answer key is included as well. A bundle of all 2017/2018 calendars is now available in my store. ***I created a homework calendar to use instead or as supplement to the Engage NY Math Modules. I love Engage NY but I struggle with giving students the homework for a topic just learned. I also have problems with students losing homework pages and packets. To fix all of these issues I created a calendar that reviews content learned in an easy to use and manage way. I feel homework is a necessary piece towards student confidence however I do not want it to be a family burden. 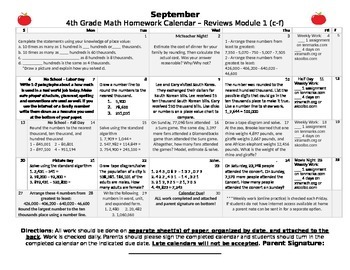 Please take a look at this free sample of my homework calendars. 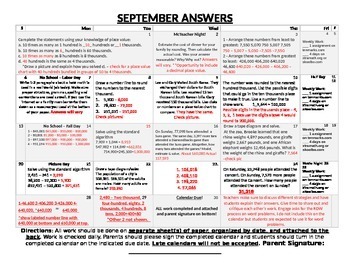 I am in the process of creating editable calendars for each month with answer keys and parent letter for sale soon. Any feedback would be greatly appreciated! !